I’m sure you’ve noticed that a lot of baby items are very unattractive and overpriced. Or if they are really cute, interesting colors, they are REALLY overpriced. When I was thinking about what to make for baby, I checked a bunch of books out from the library to get ideas of what I could realistically make and would definitely use. 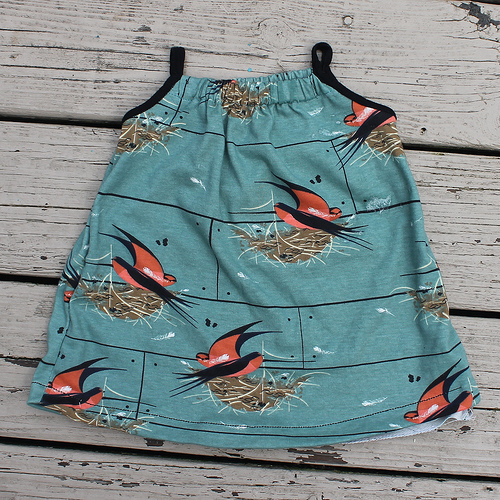 I wanted to make practical, pretty things, and my favorite book along these lines was Sew Modern Baby by Angela Yosten. 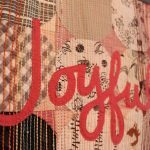 I recommend this book for the creative and totally practical variety of projects – plus she uses beautiful fabric combinations I’m sure you’ll find inspiring! I was pretty impressed by her baby play gym – it never would have occurred to me in a million years to make my own. Our playgym is in our main living area. and we are looking at it constantly, so I’m really happy I was able to make a cute one that I actually like to look at! 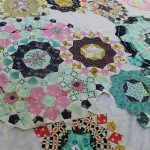 The great thing about this project is you can do it with any baby quilt – just add some ribbons to attach the overhead arches, and construct the arches, and you’re good to go. 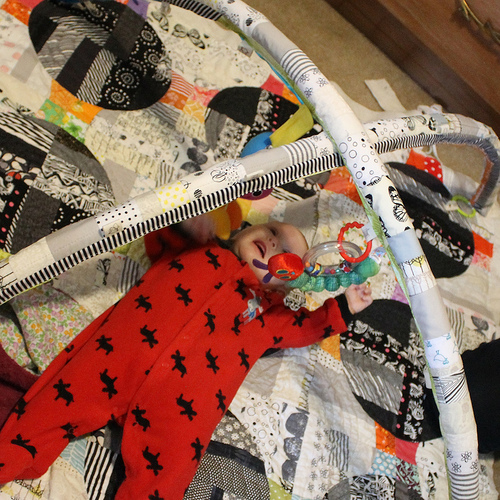 I decided to make her a double sided baby quilt/play mat (more pictures of that soon!) so I could have some variety in the play gym. 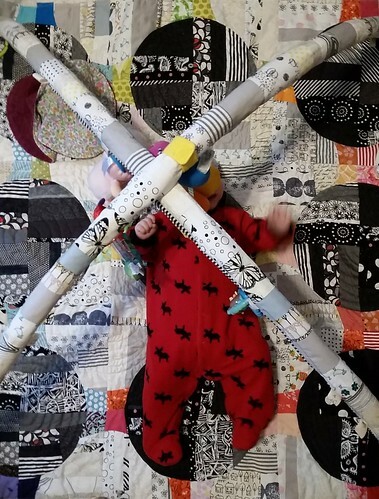 When she outgrows the play gym arches, I can pick out the stitches of the ribbons that attach the arches to the quilt, and have the quilt for whatever we want. This picture shows the other side of the mat – a rainbow ABC quilt – I’ll have a tutorial for this later too! 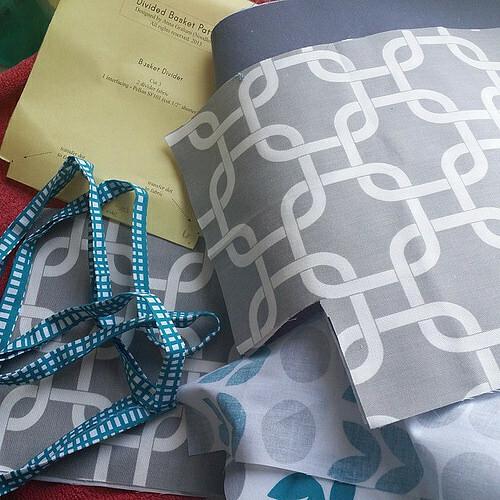 All you need to buy (besides fabric – though I made mine from stash!) is some of these baby play links – which are great developmental toys anyway – and some sort of tubing for the overhead structure. Anything somewhat flexible could work, but I ended up using blue PEX Water Pipe – because I found some cheap used at the Habitat Re-store. Note: If you don’t have the store cut it for you, you’ll need a pipe cutter, which are very cheap, to cut the pipe. I deviated from the book’s suggestions for constructing the arches quite a bit, mainly because I hate turning tubes inside out (with a passion! ha! ), and that was the method she recommended for making the overhead arches. 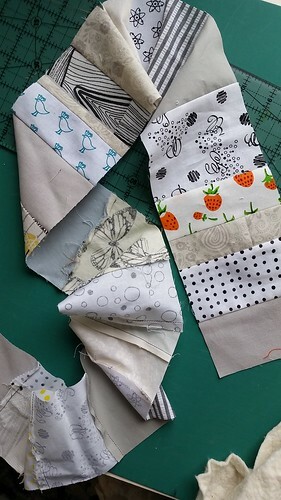 She also called for using pipe insulation to pad the arches and give them extra structure, and I wanted to use quilt batting 1. because I had some scraps on hand that I wanted to use up and 2. 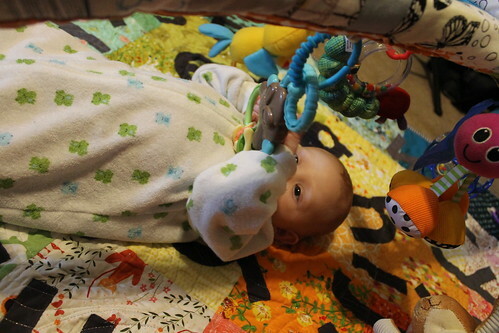 Quilt batting seemed less toxic for the baby to chew on. Another change I made was having the arches cross over each other, as pictured below. Her arches look amazing, and you should totally check out her book for the instructions on how to make them the “right” way, but if you want to know how I made my version, read on! My arches were a little loose, which I think looks fine and makes it easier to slide the tubes in, but you can adjust measurements for your own preference. I used 3/4 inch pipe, which measured 3 inches around (I just took a measuring tape and wrapped it around the pipe). 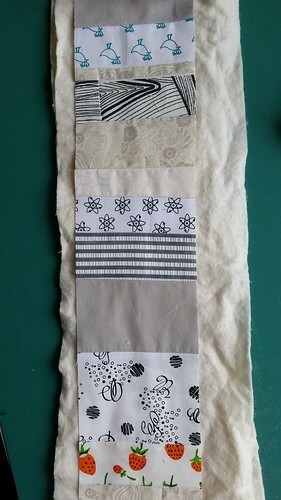 I then cut a fabric strip 4″ wide by the length of the tube plus about 6 inches. 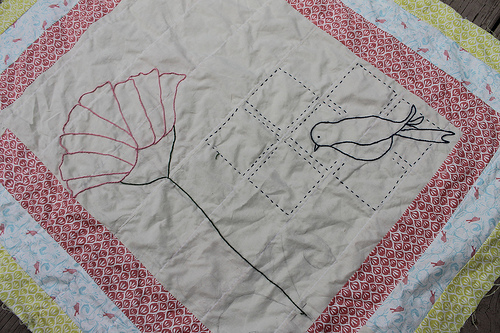 As you can see, I used super scrappy fabric, leftover from making my High Contrast Drunkard’s Path Baby Quilt I used for the mat. 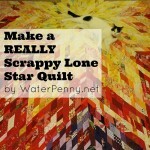 I layered that piece with two layers of scrap batting and made a very long skinny quilt! You could use spray basting to attach the layers, but I just let the natural static cling of the 100% cotton batting hold everything in place. Then, to add color and interest, I added a strip of double fold binding up each edge. 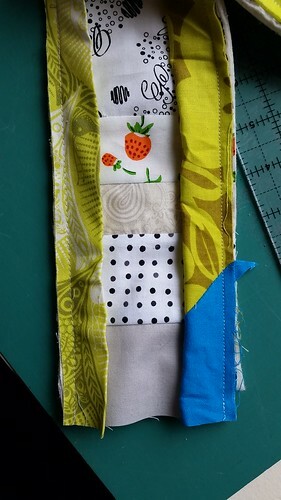 I cut the binding 2.5″ and folded it in half and sewed it along the TOP EDGE of each side. I actually used a variety of scrap binding I have saved over the years. It was nice to finally have a use for all these little strips that I really should have thrown away! 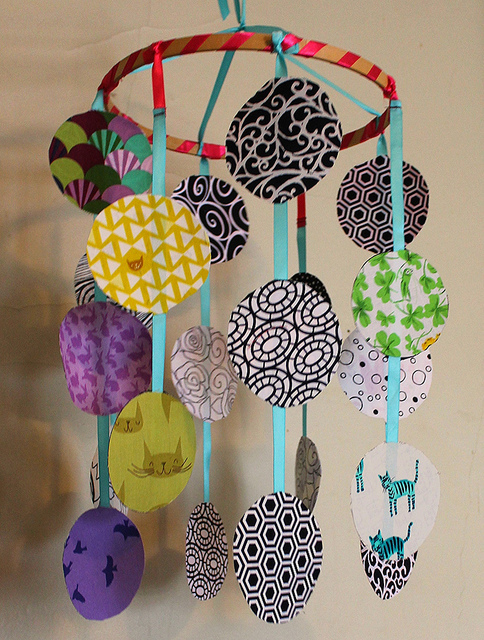 You could also use two jelly roll strips for this. Iron the binding flat and top stitch along the binding – it looks so much nicer and makes it a bit more sturdy. 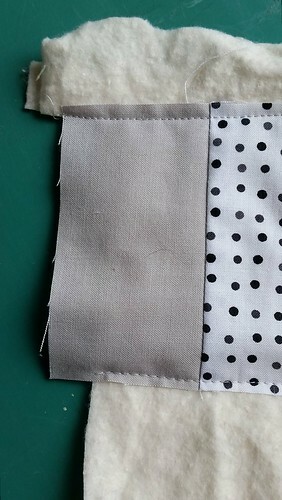 Then fold your strip in half and pin along the binding edges. Tuck in bits of folded ribbon every 6-8 inches to hang your toys from. Sew it together along the long edge. 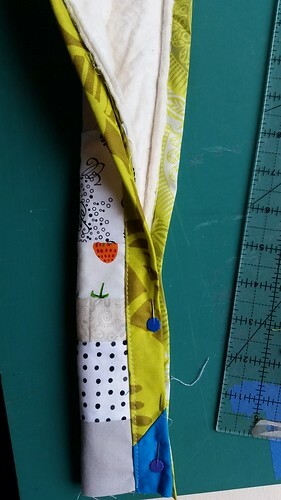 Isn’t this sewing themed twill tape adorable? I got it about 6 years ago on Etsy so I can’t tell you anything about it. Glad to finally use it! 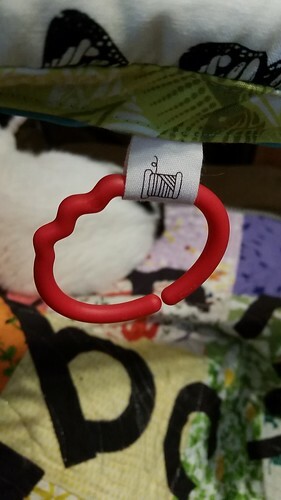 Then slide the tube over your bit of pipe, and tuck the ends inside, with another folded ribbon (this one attaches your arch to the quilt), and sew shut. I do wish I had left one end with a velcro closing, so I could slide the plastic tube in and out more easily to wash the fabric. But, if I ever do need to wash the fabric, I can just pick it open and then re-do the ends. 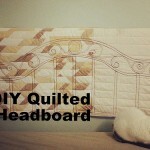 Make Your Own Quilted Headboard!